Traditionally, gynecologic cancers are approached in a multimodal fashion, employing surgery, chemotherapy, and radiation. These important therapies, while often very effective at treating malignancy, often result in difficult multisystem toxicities for patients. Identification of genomic and molecular differences between normal and cancer cells has allowed development of targeted therapies that focus on inhibition of pathways involved in cancer proliferation and metastasis. These therapies ideally provide a more directed approach by selectively acting on targets that are expressed on or in close proximity to tumor cells, thereby limiting toxicity and allowing administration at minimum effective dose rather than maximum tolerated dose, as is standard for traditional cytotoxics. 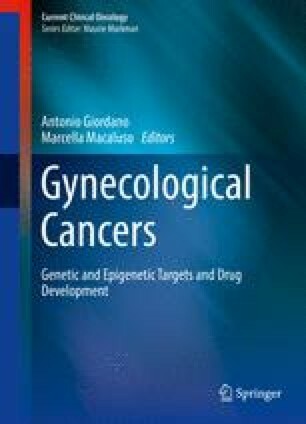 Pathways involving DNA damage repair, angiogenesis, signal transduction, cell proliferation, survival, and metabolism are under active investigation in gynecologic malignancies. Immune therapies involving vaccination and adoptive T-cell infusion are also under evaluation to augment innate tumor-specific immunity.